Our trip to Minnesota was only in part to visit my husband’s family. We also wanted to take the time to visit one of the National Park Service’s least visited national parks. In 2016, the centennial year of the national park service, we wanted to make time to savor the beauty of these American treasures, so we planned a day trip out to Isle Royale National Park. While technically part of the state of Michigan, Isle Royal is actually a series of tiny islands situated out in the vast body of water known as Lake Superior. Only designated as part of Michigan when it was discovered because Minnesota was not yet a state, Isle Royale is actually closer to Canada and the arrowhead of Minnesota than it is to Michigan. To get to Isle Royale on a day trip, it’s easiest to take a 2-hour ferry ride from Grand Portage, Minnesota, which is essentially the northern most town right on the arrowhead of Minnesota before you cross over into Canada. Since Grand Portage is quite a distance away, and we needed to be on the ferry early in the morning, we decided to spend a night in Tofte, at a small chalet right along the banks of Lake Superior. During our daytime explorations of the North Shore of Lake Superior, we stopped in the small town Grand Marais to grab a bit of dinner to bring back to our hotel room and enjoy while we watched the sun set over the lake. Growing up in Northern Minnesota, my husband, as a kid had often heard of this particular eatery located in Grand Marais, but had never been to it himself. So, when we found ourselves in Grand Marais and we spotted this restaurant, he suggested we pick up some food to go and bring it back with us to our hotel. 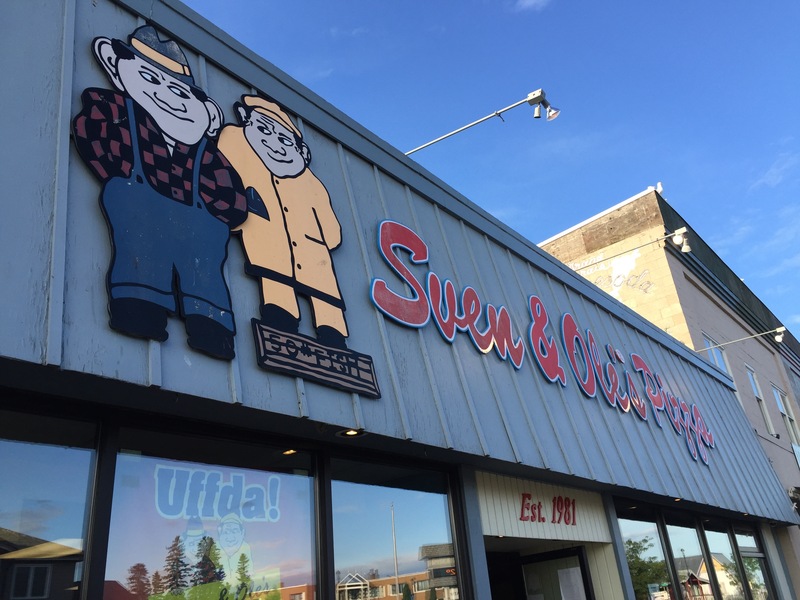 Sven & Ole’s Pizza is a well-known, and well-loved Northern Minnesota institution, and arguably the best known eatery in Grand Marais. Started in 1981 by two brothers home from school during summer break who wanted to open a small food stand, Sven & Ole’s was only open for a brief few summer months that first year. However, in 1982, once the doors opened at the beginning of June, they never closed again, and more than 35 years later, Sven & Ole’s Pizza has grown from a 200 square foot space to more than 3,500 square feet and over 50 employees. Sven & Ole’s continues to be family operated by one of the original brothers’ sons, though both brothers are still involved in promotion and advertising of the restaurant. The name and theme of the restaurant and menu items is a bit of an homage to the area’s local Scandinavian population who immigrated to Northern Minnesota generations ago and whose descendants still continue to impart their Norwegian, Swedish and Finnish culture and traditions to the area and to the people. When we strolled into Sven & Ole’s Pizza, it was packed to the brim. The dining room was filled to capacity and there were people wandering all over looking for a space to sit. The idea is to order your food at the counter, take your number, and then go and find yourself a place to sit in the dining room. Hopefully, in the 15-20 minutes it takes to make your pizza, you’ve been able to locate a table. Luckily for us, we only wanted take out so that we could go back to our hotel room and enjoy the view of the setting sun over the lake while we munched on pizza for dinner. After placing our order, we walked around town for 20 minutes enjoying the scenery before we came back, picked up our order and headed back to the resort we were staying at. We wanted more than just pizza for dinner, so we decided to get an order of garlic bread with cheese, served with a side of marinara sauce to start. The garlic bread was nice and thick, just the way I personally like it. It was toasted to perfection so that it was crispy and crunchy on the outside and piping hot and tender on the inside. Sven & Ole’s loaded up the garlic bread with tons of melted cheese on top, which was bubbly and golden brown. An order of garlic bread got us six incredibly, big slices. But it was so good, and so delicious that we didn’t have any trouble finishing off the bread. 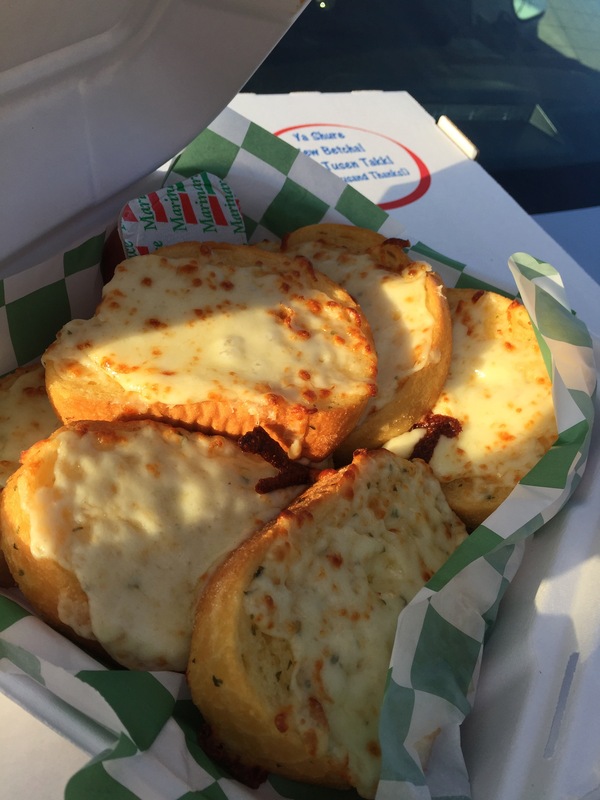 The garlic bread was loaded with terrific garlic butter flavor, the bread was crunchy, and the cheese was stringy and gooey bit with a subtle enough flavor that you could taste the garlic and the butter and all that goodness. Definitely one of the better garlic breads I’ve had in a long time. For our pizza selection, we ordered the Havaiian BBQ Shicken. Notice the spelling and pronunciation of the name of the pizza. Again, remember, this is an homage to the area’s proud and longstanding Scandinavian heritage. The Havaiian BBQ Shicken pizza is made with grilled chicken, crispy bacon, bbq sauce, onions, pineapple and mozzarella cheese. The pizza was enormous and loaded with toppings. The crust was perfect baked so that it was crunchy and crispy on the outside, and slightly yeasty on the inside. The toppings were piled high on the pizza, and what I loved is that they actually chopped up all of the toppings into small morsels so that they were actually bite-sized and you didn’t have to take enormous bites of pizza just to fit the toppings in your mouth. The flavor combination of the grilled chicken and the crispy bacon were amazing. You could taste the char on the chicken, and I liked that again, the pieces of the chicken were chopped small enough. 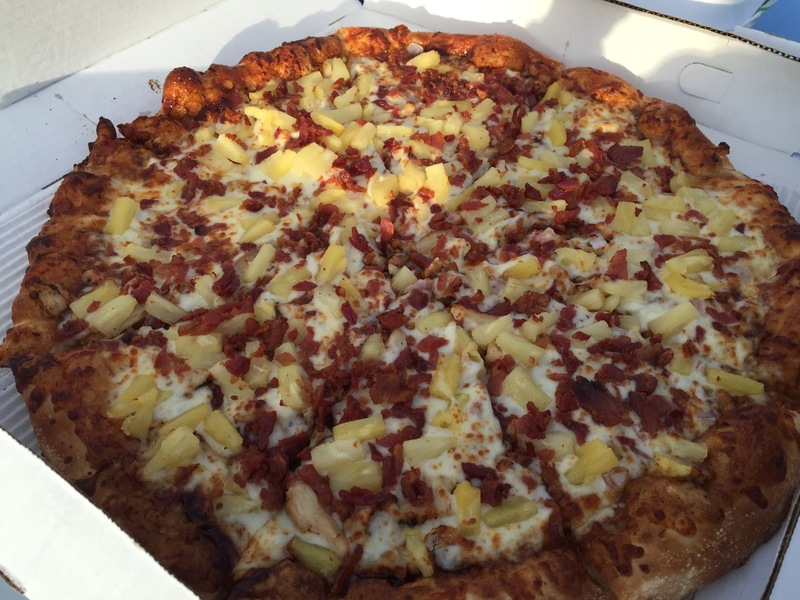 There was an even distribution of the chicken, and the bacon and the onions and the pineapple distributed all throughout the pizza. The bbq sauce was amazing as well, with a terrific bbq flavor that combined well with all of the ingredients, but wasn’t so overpowering that you couldn’t taste anything else on the pizza. The mild flavor of the sauce was perfect, to bring out the sweetness in the pineapple and the flavors of the onions and chicken and bacon. This was an incredibly well done “Havaiian” pizza. After our first bite of pizza, my husband and I turned to each other and nodded in approval of our selection of pizza. This pizza hit the spot in so many ways. It’s no wonder that Sven & Ole’s Pizza has the reputation throughout Northern Minnesota that it does. If I lived any closer, I’m sure I’d visit Sven & Ole’s time and time again. This was, hands down, the best pizza and garlic bread meal I’ve had in a long, long time. The flavors, the combination, the cooked-to-perfection goodness just put an exclamation point on a terrific day. Enjoying this great food while sitting at the dining room table in our hotel room looking out over the wide expanse of Lake Superior as the colors of the sky turned from blue to orange to pink to purple and then to black was fantastic. This is one of those experiences that everyone should have at least once. 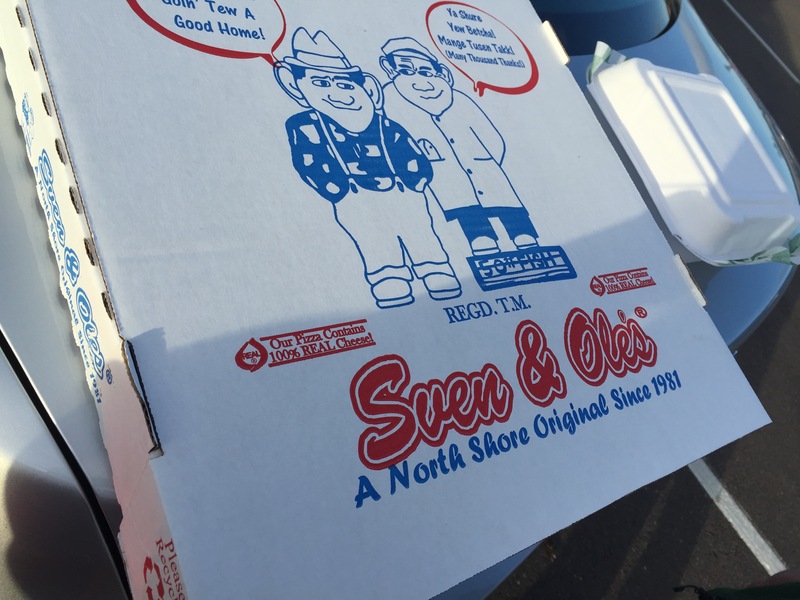 If I could get my hands on some Sven & Ole’s pizza right now, it’d be heaven. It’s so yummy, right? Their crust is so good. They say yew haven’t been tew Grand Marais until yew’ve been to Sven and Ole’s.